HB 21 is now eligible to be considered by the full House. The House Appropriations Committee is expected to pass its budget this week, with a full House vote likely next week. The proposed Senate budget, expected to pass the chamber on Tuesday, would cut state funding for public schools by $1.8 billion in general revenue, and use local property tax revenue to make up the difference. House Speaker Joe Straus said the House would prioritize the school finance plan. "This bill will improve our schools. It puts more resources into the classroom, reduces Robin Hood and begins fixing our school finance system. It also begins to reduce the pressure on local property taxes, which have been funding a greater and greater share of education," he said in a statement Tuesday after the vote. Tuesday’s vote represents one step in an effort to overhaul a tired school finance system, which many agree does not fund schools adequately or equitably. The Texas Supreme Court last year ruled the system constitutional, but in need of major reform. One of the most controversial parts of Huberty’s bill would eliminate a state aid program designed to offset a decade-old tax cut. That has upset many small, rural school districts that depend on the program to keep their doors open. When legislators reduced property taxes by a third in 2006, they guaranteed school districts at least the same amount of funding as they received in 2005-06. That program is set to expire Sept. 1, with 156 school districts still relying on it. 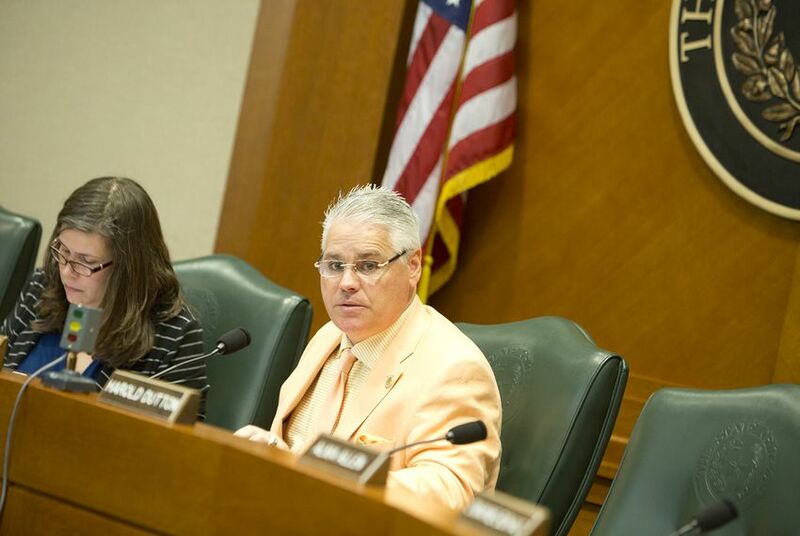 Huberty’s bill would let the program expire and create a transitional $200 grant program over the next two years to help all school districts that lose money under the bill. Districts losing money would get more funding from the grant program if they have higher property tax rates. Christy Rome, executive director of the Texas School Coalition, which represents some districts relying on the 2006 state aid program, said the bill provides a “landing pad” for districts that would otherwise fall off a funding cliff. Rep. Morgan Meyer, R-Dallas, was the committee’s sole vote against the bill. He said he could not support the measure because Highland Park, a school district he represents, is in the small percentage of districts that would lose funding. Highland Park ISD would lose about $208 per student in 2018, and $56 per student in 2019, according to the Legislative Budget Board’s calculations. In both years, it would be eligible for funding from the hardship grant program created in this bill – bringing the loss to $80 per student in 2018 and $25 per student in 2019. Dallas ISD, which Meyer represents a small portion of, would gain $188 per student in 2018 and $190 per student in 2019, under this bill. School districts urged House lawmakers on Tuesday not to create winners and losers as they work to revamp the state's public school funding system.